LOS ANGELES - A U.S. judge said on Tuesday that PG&E may not resume paying dividends and must use the money to fund its plan for cutting down trees to reduce the risk of wildfires in California, stopping short of more costly measures he proposed earlier this year. The new criminal probation terms for PG&E are modest compared with ones the judge had in mind in January and that PG&E said could have cost upwards of $150 billion. 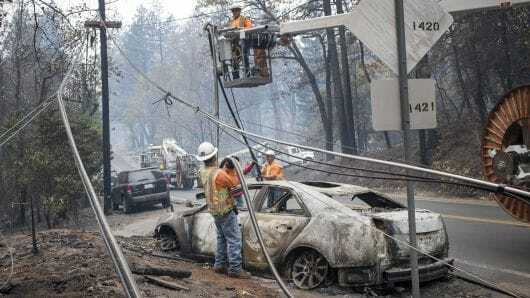 The terms will, however, keep PG&E under the supervision of Judge William Alsup of the U.S. District Court for the Northern District of California and hold the company, which also is in Chapter 11 bankruptcy, to its target for clearing areas around its power lines of some 375,000 trees this year. PG&E's probation stems from its felony conviction after a deadly 2010 natural gas pipeline blast in San Bruno, California, near San Francisco, that killed eight people and injured 58 others. At a January hearing, Alsup, who is overseeing PG&E's probation, said he felt compelled to propose additional probation terms in the aftermath of Camp Fire. San Francisco-based PG&E expects its equipment will be found to have caused the blaze. The probation process is separate from San Francisco-based PG&E's bankruptcy filing. As the company faces $30 billion in wildfire liabilities and bankruptcy proceedings, the energy company is expected to name as its new chief executive Bill Johnson, a source said on Tuesday. Johnson has been the CEO of the Tennessee Valley Authority since 2013 and is retiring on Friday. The judge said PG&E will not be able to pay shareholders until it complies with his new probation terms. Shares fell 2% on Tuesday to close at $17.66 on the New York Stock Exchange and are down 63% since November 2018 due to concerns about the company's bankruptcy and wildfire liabilities. The shares traded as low as $5.07 in January. PG&E paid $798 million in dividends in 2017 and $925 million in 2016, a period in which the company did a poor job of clearing areas around its power lines of hazardous trees, according to Alsup. Lawyers for PG&E did not contest the new terms, which the company considers more feasible than terms Alsup proposed in January. To comply with the terms Alsup proposed in January, PG&E said it would have to remove 100 million trees. The company added that shutting power lines during high winds as Alsup proposed would not be feasible because the lines traverse rural areas to service cities and suburbs. Idling lines could also affect the power grid in other states, PG&E said. Alsup on Tuesday said he was still considering his proposal to require PG&E to shut down power lines during windy weather to prevent tree branches from making contact and sparking fires.